Tuberculosis (TB) still continues to be a major killer disease worldwide. Unlike other bacteria Mycobacterium tuberculosis (Mtb) has the ability to become dormant within the host and to develop resistance. Hence efforts are being made to overcome these problems by searching for new antitubercular agents which may be useful in the treatment of multidrug-(MDR) and extensively drugresistant (XDR) M. tuberculosis and shortening the treatment time. The recent introduction of bedaquiline to treat MDR-TB and XDR-TB may improve the status of TB treatment. The target enzymes in anti-TB drug discovery programs play a key role, hence efforts have been made to review the work on molecules including antiTB drugs acting on different enzyme targets including ATP synthase, the target for bedaquiline. Literature searches have been carried out to find the different chemical molecules including drugs and their molecular targets responsible for their antitubercular activities in recent years. This review provides an overview of the chemical structures with their antitubercular activities and enzyme targets like InhA, ATP synthase, Lip Y, transmembrane transport protein large (MmpL3), and decaprenylphospho-β-D-ribofuranose 2-oxidase, (DprE1). The major focus has been on the new target ATP synthase. Such an attempt may be useful in designing new chemical entities (NCEs) for specific and multi-drug targeting against Mtb. Keywords: Mycobacterium tuberculosis, Enzyme targets, Inhibitors, Minimum inhibitory concentration (MIC), Tuberculosis (TB), ATP. Keywords:Mycobacterium tuberculosis, Enzyme targets, Inhibitors, Minimum inhibitory concentration (MIC), Tuberculosis (TB), ATP. Abstract:Tuberculosis (TB) still continues to be a major killer disease worldwide. Unlike other bacteria Mycobacterium tuberculosis (Mtb) has the ability to become dormant within the host and to develop resistance. Hence efforts are being made to overcome these problems by searching for new antitubercular agents which may be useful in the treatment of multidrug-(MDR) and extensively drugresistant (XDR) M. tuberculosis and shortening the treatment time. The recent introduction of bedaquiline to treat MDR-TB and XDR-TB may improve the status of TB treatment. The target enzymes in anti-TB drug discovery programs play a key role, hence efforts have been made to review the work on molecules including antiTB drugs acting on different enzyme targets including ATP synthase, the target for bedaquiline. Literature searches have been carried out to find the different chemical molecules including drugs and their molecular targets responsible for their antitubercular activities in recent years. This review provides an overview of the chemical structures with their antitubercular activities and enzyme targets like InhA, ATP synthase, Lip Y, transmembrane transport protein large (MmpL3), and decaprenylphospho-β-D-ribofuranose 2-oxidase, (DprE1). 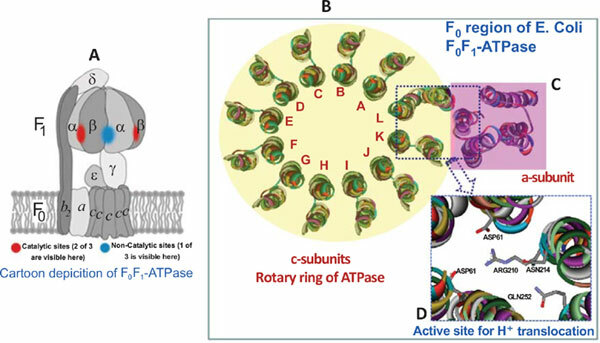 The major focus has been on the new target ATP synthase. Such an attempt may be useful in designing new chemical entities (NCEs) for specific and multi-drug targeting against Mtb.